"The book contains a practical approach and real actions that can transform the credibility and alignment of IT to the business." "A significant addition to the Enterprise Architect's bookshelf." Many IT deployments fall short of delivering value to the businesses that pay for them. On top of this, the combined forces of rapid business change and technology innovation frequently outpace the ability of IT organisations to make sense of their implications. With business activity and IT now so intimately intertwined, organizations urgently need a framework which allows them to align IT capabilities with business strategies and priorities in a way that is sustainable. * Adoption guidelines - a set of self-assessment checklists that readers can use to understand where they are on the IT-business alignment roadmap and how to progress. With groundbreaking research and proven approaches, this blueprint enables readers to understand what is at the heart of IT-business alignment. 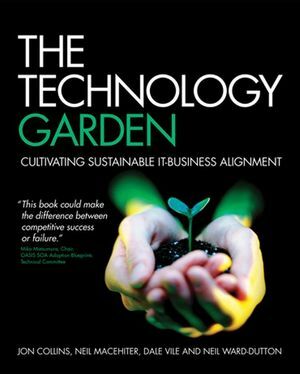 Combining IT research, analysis and real-world insight, The Technology Garden is the ultimate no-nonsense guide. Jon Collins has nearly 20 years of experience in IT. Jon has worked as an industry analyst for over 7 years, for companies including Quocirca, Bloor Research and IDC. He has acted as an advisor to leading vendors including Cisco, EMC, IBM and Microsoft, and to large IT user organisations in the Government, Telecommunications and Financial Services sectors. Neil Macehiter is one of the founders of Macehiter Ward-Dutton, an IT advisory firm focused firmly on the challenge of IT-business alignment. He has almost 21 years of experience in the IT industry, having worked in consulting, product and technology strategy roles for vendors. Dale Vile is the research director of Freeform Dynamics. He specialises in monitoring how IT industry developments map onto practical business needs in the Enterprise and SMB mainstream. Neil Ward-Dutton is the other founder of Macehiter Ward-Dutton. He has over 15 years of experience in the IT industry - in a mixture of consulting and industry analysis roles. He started his career as a business analyst at ICI, and then spent a number of years as a software engineer working for one of the UK's leading software consultancies at the time, Praxis. 2. The current realities of business and IT. 3. The IT organisation must get the basics right. 4. Create a common language. 5. Establish a peer relationship between business and IT. 6. Work towards coordinated goals and objectives. 7. Manage IT as a business-driven portfolio. 8. Foster relationships with key IT suppliers. Appendix IT–business alignment scorecard toolkit.